“My Car-Dwelling Life” is the only name we have for this brave young woman who decided to chronicle her life on YouTube. And why is she chronicling her life, well, she decided that her credit card debt was just too stressful with trying to pay rent and car payments plus insurance. Though she works full-time, she had no joy in her life and all she thought about was her bills and her humoungus amount of debt she gathered while in college. 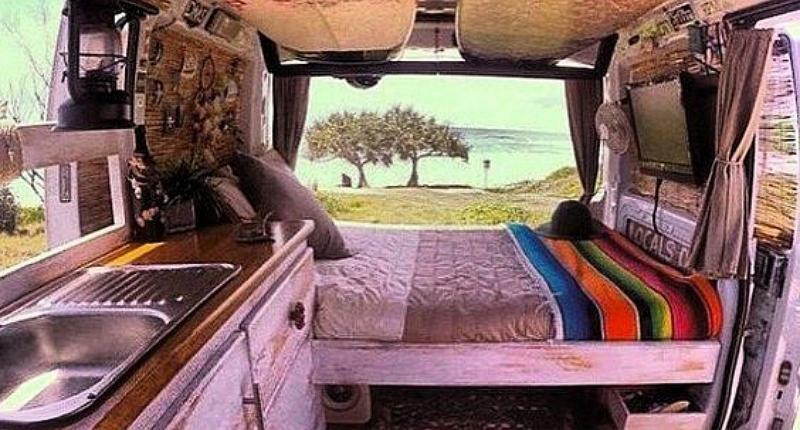 She decided that her overall plan is to buy an old van and convert it into a permanent traveling living space, but while she is paying off all of her debt, she is now living in her car, by choice. No rent – She saves approximately a thousand dollars by not having rent and other utility bills that go along with living in an apartment. No furniture – Like most people, this car dweller, used to spend money on furniture and household knick-knacks that really were’nt needed but that she bought to impress family and friends. No utility bills – She is free from paying utility bills each month, and in the process, gave up television altogether because she found out through this transition of living in her car, that there was nothing she missed. She spends less on clothing – Spending less on clothing is another perk. Since there isn’t a lot of room for a full wardobe, she sold and gave away a lot of her clothing and only kept the clothing she really needed or really loved. Showering/bathroom – Most people car and van dwellers use the gym for showering facilities and that is just what this car-dweller is doing. Paying a small monthly gym fee is nothing like paying rent and you can exercise every day or every couple of days and shower while you’re there. Bathroom- When nature calls, she has learned of all the places she can go to use a decent bathroom. Even in the middle of the night, which she says doesn’t happen often, she has a map of all the 24 hour superstores where she could go in an emergency. It isn’t the most convenient plan, but it does work out temporarily. Sleep – Sleep was a bit uncomfortable at first, but after trial and error and a few blankets and pillows, sleeping in the back of her car became quite easy. Curtains were also installed in the car that could be drawn in the evenings and at night for privacy. Telling friends and family – People may think you are a little crazy for choosing to live in your car, so at first, it’s a little embarrassing to share this info. But it appears that you can get over that and explain to people if you choose, that you are saving to convert a van into a real home. And that living in your car is a temporary and cheap solution. “Her Car-Dwelling Life” is very happy with her decision and has calculated that what was once three years of debt has dwindled down to just 8 months. After all of her debt is paid off, she intends to look for a van that requires some TLC and convert it into her traveling home. She has also decided that she isn’t looking for any more permanent jobs. She just wants to live on the road, park by the beach when she can and live life on her own terms, while experiencing new adventures.